Tuesday, April 10, 2018 at 9:28 a.m.
Every day thousands of vehicles visit downtown Spokane but there are only 3,600 on-street meter parking stalls. Creating a healthy turnover at these on-street meter parking stalls to allow for citizens access to business and venues is just one of the many key issues that will be examined in our new parking study. 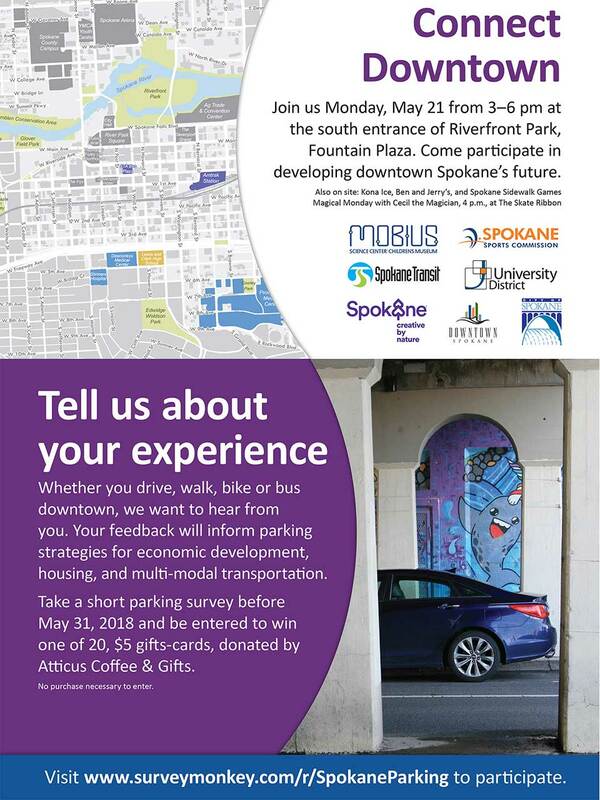 The City of Spokane is working with Nelson\Nygaard of Portland, Oregon on a downtown parking study. In addition, there will be a separate parking study of the growing University District. Throughout the duration of this study citizens are encouraged to provide feedback. The first opportunity to provide your feedback will be through a forthcoming survey. Nelson\Nygaard is expected to present the final plan and recommendations in February 2019. The University District is one of the fastest growing areas in Spokane. Understanding the inventory of the parking supply is important as we plan for the district’s future. This will be the primary purpose of the University District Parking Study. Nelson\Nygaard will work with the City and University District Development Association, UDDA to create a comprehensive parking inventory database that includes on-street meter parking and off-street parking lots. You can view a map of the University District study area here (PDF 531 KB). The University District Parking Study will be completed this August. Moving forward, the City UDDA and our partners see the need for a more comprehensive study of parking utilization and proposal of strategies. We have all decided that a second phase of the study will be needed. The City will be launching a web page about the parking study. This page will later include an online survey that Nelson\Nygaard is currently working on.